·· Wire thimbles...I love you! ·· Where have you been all my life, hon? I'm waiting on my "wire guardians"...I didn't get the brand name Wire Guardians, just something like it from Rings 'n' Things. And my fancy crimps. I'm getting nervous now that the crimps somehow won't work. I use 0.014" Softflex and I'm getting 2mm x 2mm crimp tubes from Artbeads. 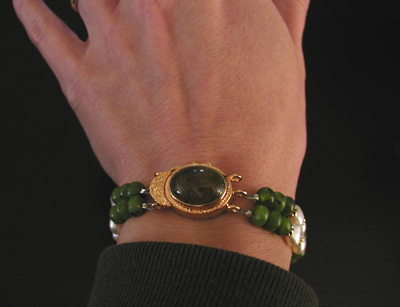 I suppose I could use thicker Softflex, but so many of my designs use pearls and gemstones with small holes. All this time I've been using up some Beadalon crimps I had left over from my early days of making jewelry. And they've been fine...just plated base metal crimps. I checked and found my Beadalon crimps are likely to have a smaller inner diameter than the 2 x 2 ones (the inner diameter isn't listed on the Artbeads site but it is for Rings 'n' Things' 2 x 2 crimps). Can't wait to try the new ones out though. 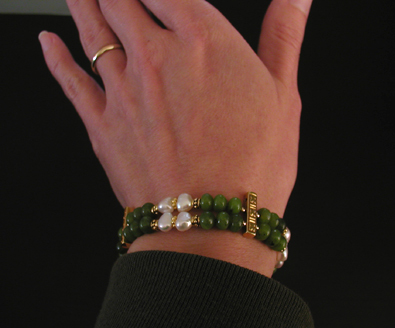 In the meantime, I'm doing a jade and pearl bracelet. It does get easier. I tend to make my bracelets a little too long...I hate it when bracelets just fit, unless of course they're supposed to be like that. It just feels as if whoever made it was cheap with their materials. But realistically, making a bracelet too long isn't better. 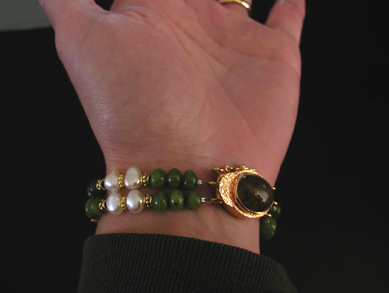 This one fits better, it uses some jade rondelle beads I got a long time ago. I didn't know what to do with them before. Now they look quite beautiful with the pearls and gold vermeil. What I'll do is take some old Softflex...any time I dismantle a piece, I save the Softflex if it's long enough to use for bracelets...and my cheaper plated crimps, and just try out the design. One thing I like to do, when ordering stuff online that I've never seen before...is similar to the Fire Mountain Gems "virtual beadboard." Only for this you use Photoshop. 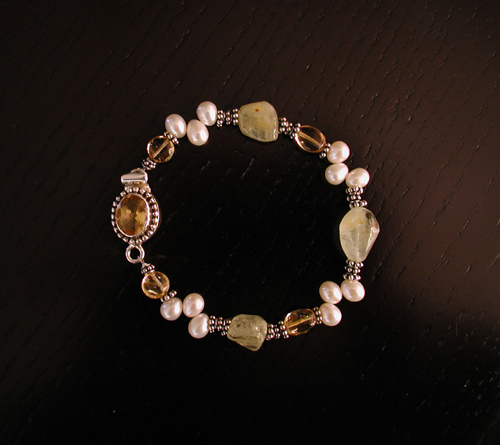 I did that for my last clasp order. I saved the images of the clasps I was interested in, then cropped the images and scaled them (for this you need to change the "print size"). I put the images all on one page and printed that out. It's not 100% accurate, since the photos are usually taken at an angle, but it's pretty close. When I got the clasps, I was happy to see they were quite similar to my crude Photoshop print-out. 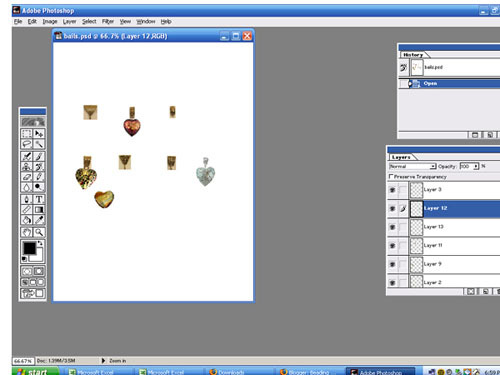 Now I have a Photoshop document of various bails and heart-shaped beads going on. I lined the bails up in rows, then copied out the hearts. You need only move the heart from bail to bail, to get an idea whether the bail would fit the heart. Where have you been all my life, hon? WOW! I just got finished reading this. Lots and lots of good info. Sometimes jewelrymaking can feel like...climbing a mountain. You know you'll get to the top at some point; it just feels like a really long climb. Well I've discovered a few things. One is that--even though there is almost always a substantial incentive to buy in bulk--it may not be worth buying in bulk, until you have a definite feel for "what you use." And that takes time. Two is that, once you've started collecting stones, you can design a lot of stuff you never thought of, by using odd bits and pieces from other projects. I've concluded that many bracelets and earrings are the products of "unused this and that from other projects." 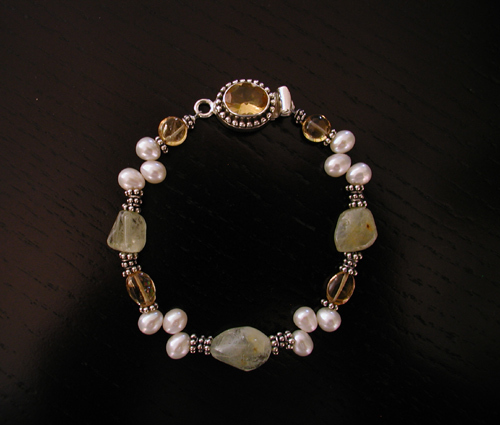 Today I'm trying out a bracelet made from the "yellow" stones on an aquamarine strand...I pulled the bluest ones for another project. These stones are almost jade green, and they're quite beautiful, used by themselves rather than mixed with the blue and clear stones on the strand. I combined these with some citrines I had from other strands...smooth ovals and coins...plus a citrine clasp I must have used three times by now and was never happy with. And some smaller sized top drilled white freshwater pearls (these are very handy to have on hand), and some sterling Bali beads. Yep, it's "leftovers" from several projects, but it looks pretty cool so far. I'm debating now, whether to try french wire or wire guardians next. I can see the point of both...the french wire looks nicer, and it's cheaper. On the other hand...wondering if the wire guardians wear better. Looking at it, trying both of them out would be fairly inexpensive. I got to wear my white square pearl bracelet the other day...and for me, that is the thing. Aside from some truly fancy pieces (which everyone has to own for special occasions), everything I make has to be useful. It has to end up getting worn. Hm. The pearls themselves are perfect...it's a simpler setting than I would normally do, but that is the beauty of the piece. The sole gripe I might have is with the toggle...I didn't buy it for this piece (I was planning to use it for a necklace). It holds well, but it's heavier than the pearls, so it always slides to the bottom. 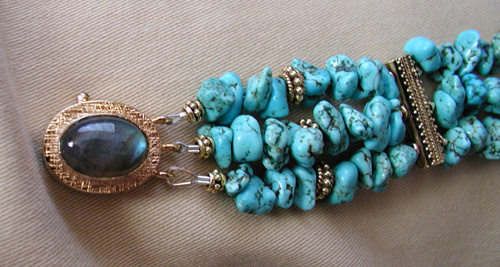 With a plain clasp that would not be an issue, but it's a fancy toggle and I'd rather it show. 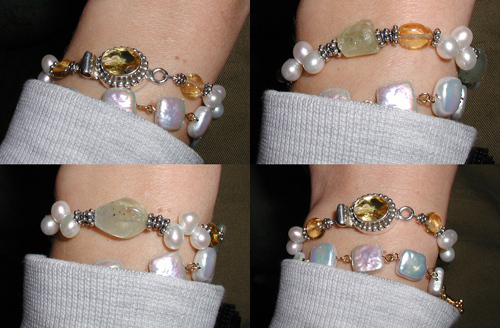 I have my eye on a pearl and vermeil box clasp...it's ridiculously hard to find btw...but it's out of stock currently. So I'll wear it with the toggle until I can get hold of the box one or something else that'll work. I like this so far. I actually slept with it on last night...okay usually I don't do that, but I was curious to see if anything would pull loose. It's fine; it didn't even come off. In the pics it looks as if it just fits but it's regular bracelet size. 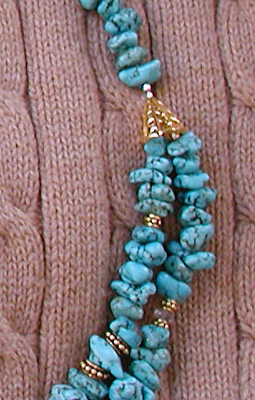 The cones didn't work out; I wore the two-to-one turquoise necklace for a while. They're beautiful cones and I'm not worried about finding a use for them, but for that particular design, you really need reducer beads. As I'm going along, I realize how much of what I need to finish this piece or that, relies upon Balinese components. I'm thinking now about placing an order. It requires more planning because fewer orders are better, but the markup on Bali components here is substantial. Neither of these is 100% finished as of yet. Usually I put off using crimp covers until I'm sure the piece is perfect. The piece on the right, needs crimp covers on top of the cones as well as in back. It's kind of awkward wearing it without the covers, but then it's hard to recycle the covers, and I like to wear the piece at least one day, all day, before deciding it's done (I'm not sure if the length is right for this piece). 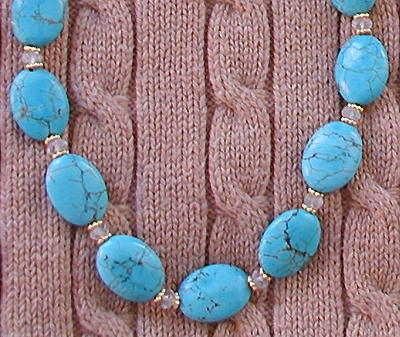 These are both American turquoise. Here you see the cones I was blogging about earlier. They're really nice cones (from Baubles and Beads in Berkeley). You know what's almost absurdly hard to find? A vermeil reducer bead. ...for a fabulously reasonable price, but vermeil? Suddenly the pickings get very slim. I did find a few...the best were on those "direct from Bali" sites, but the minimum order tends to be at least $75 (with $15 shipping). Second would be "direct from India" (no minimum order, but $25 handling charge). Third, the odd one here and there, but little selection and much higher prices. I decided to try my latest design using cones instead of reducer beads. I'm still not sure if I like it, or if it's worth waiting to place a large order of Bali beads direct from Bali (the price per bead is astonishingly low, the selection fantastically wide). It's a Flickr "group"; I'm not part of it, don't have a Flickr account actually, but it looks interesting. I'm wearing a new piece I finished today. It's something I designed for someone else, but still I have to wear it, to see if the design works. I wear each and every new design I make...by the end of the day, I know whether or not the design works, whether or not I feel like ever wearing the piece again. I suppose at least some of this mentality derives from my cosmetic-obsession days. Owning a cosmetic means absolutely nothing to me. A cosmetic that looks great in the pan or tube means nothing to me. It has to work, and it has to be worn. This piece is working so far. During the day I decided to add two crystals to it. I'll take a pic of it...it's basically a goldfilled chain, with 17 Swarovski crystals on it, and four vermeil Indian beads. That's it but it's a good design, you could plug in any bead for the Swarovski's and the Indian beads. I'm testing to see if it feels heavy toward the end of the day, if it migrates a lot, if it's "enough," if it's "too much." I just finished off a couple other pieces, that were sitting there waiting for clasps. One is a necklace made of top-drilled freshwater pearls, black and clear Swarovski crystals, vermeil daisy spacers...I put a two-strand vermeil clasp on that one. The other is a two-strand necklace made of citrine beads, Bali silver spacers, an Indian silver and citrine bead, and a citrine teardrop-shaped bead (it sounds more complicated than it is). Here I was sorely tempted to use the silver version of the two-strand clasp I used on the other necklace, buuuuut...I still could do it...it just seemed like a waste of a two-strand clasp, because the original design used a one-strand one. So I went for a Turkish filigree one-strand clasp. It's all in the clasp...I almost hate saying that, because I'd like to think the clasp part is unimportant since it isn't always seen. The problem is a.) sometimes you do see it and b.) having an extender chain is always a good idea for a good necklace. It costs a bit more up front but in the long run, you can wear the same necklace with far more outfits. Technically I suppose my "year" should begin in September of 2005. 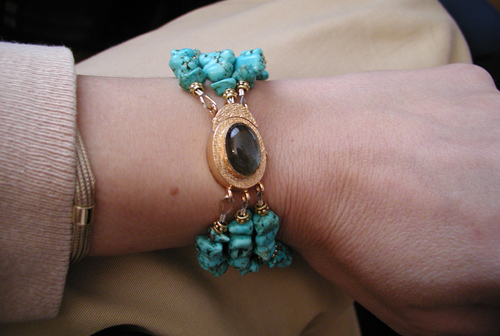 That is when I began blogging about my beading exploits. But, it's easier to mark the beginning of a year now, so let's do that. I'm not doing anything remotely like that now. For one thing, I don't use premade earring forms. I'm not dissing it...there are some really good ones on the market, such as Balinese and Turkish filigree forms...it's just that I'm not interested in using them right now. Right now, I'd rather make my own forms. Secondly, I seldom use readymade headpins anymore. I will use them as necessary (I had a design recently where the handmade ones didn't work, they kept sticking to my sweater, so I switched them out). Thirdly, I don't use base metal wire. The best thing I ever bought was bulk jewelry wire online (good prices at Artbeads.com, Rings 'n' Things, Firemountaingems, etc.). Fourthly, I don't often use glass. I still use some here and there but it's no longer a staple. I do use crystal. Fifthly, I use niobium earring wires. I tossed the surgical stainless steel ones I had before; the niobium ones work better. Other changes...usually, it takes me several days now, to come up with a single design. What I end up with, can be very different from what I started out with, or from what I thought the design would be. There was a jewelrymaking.about.com article about these devices, but I can't seem to find it now. Anyhow it did cross my mind to buy one (the cheaper one obviously), but then--as beaders must--I had to pause and consider whether or not such a thing would be necessary. There are tons of tools available for beaders, and many of them are expensive. You have to consciously decide what you need and what you don't. I decided against it and realized part of the problem I'd been having recently is that I need to replace my contact lenses. The toric one has become loose, so that eye loses its focus whenever the lens slides, which tends to be whenever I need to examine something up close. Really annoying but I need to replace it anyway. And anyhow, I've come to change my philosophy about wrapping. Rather than seeing it as a chore, I see it as an opportunity to practice. I did that today and decided that even if I had to do the same wrap 100 times, I would just do it 100 times. Who cares? You're reusing the same beads over and over again; your sole loss is the wire itself, but I figured it's one of those things. Once you've done it often enough, it becomes a matter of all those many, tiny little things you do that make it easy. I discovered I'd been tapping the wire tail down too hard. It's not necessary, in fact pressing the wire too hard only weakens it. Press it too hard and the entire wrap snaps off if you bend it slightly. So, what you want to do is gently, gently press it down, turning the link as you go. Just softly tap it down so the tail lies flat against the wire. I also try to trim the tail as short as I can, before tucking it. Less tail to tuck, means less chance of error. It's crossed my mind that dead soft wire might be better for this. I've gotten used to half hard so I'm not likely to switch, but it might be worth a try. I also try to figure when to cut the tail...with my recent eye problem, I was cutting it too late, not leaving enough room to tuck it properly. Cut sooner. I try to engineer all of my designs so that a wrapped loop is not connected to another wrapped loop. I mean you can connect two wrapped loops, but I've found that most designs work without ever having to do that. I go over the finished piece and examine each wrap and if I'm not happy with any one of them, I'll go ahead and redo it. So far, so good. Out of all of these tips, I think the most important one is to be willing to do the same wrap 100 times. lol Once you relax, it's much easier to do the work. I'll have some pics soon of what I've been doing recently.